Brookhaven Retreat, a unique voluntary residential facility exclusively for women with mental health and/or substance issues, is pleased to present their new and improved blog. The new Brookhaven Retreat blog can be a valuable resource for women who are struggling with depression, bipolar disorder, alcoholism or other mental health and addiction issues. The relevant topics that are posted provides readers with a better understanding of Brookhaven Retreat and their values and philosophy. Owner Jacqueline Dawes shares real life experiences that allow readers to put into practice what is being taught at Brookhaven Retreat. Readers can now engage and leave comments. This gives blog readers the opportunity to be involved and share their feelings about the blog and how it has affected them. The Brookhaven Retreat blog contains insightful new blog posts that are updated on a regular basis. These posts contain stories that touch on topics that are relevant to women and their families who are struggling with depression, bipolar disorder, alcoholism or other mental health and addiction issues. 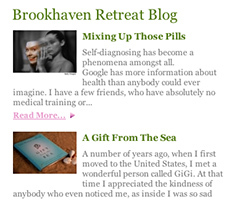 Each post lets readers understand the mindset and values of Brookhaven Retreat. Beautiful and often inspiring pictures compliment each Brookhaven Retreat blog article.